To most Americans, the wars in Iraq and Afghanistan is reflected in occasional news reports from the battlefield and media images of the coffins being unloaded at an air base in Delaware. Compared to earlier wars, very few Americans are actually engaged in the fighting and few citizens actually know anyone who has fought and returned to tell the tale of their wartime experiences. The closest most of us come to that reality is in reading well-written books by people who have been there and experienced the fighting firsthand. This new book, A Chosen Few, is such a book. 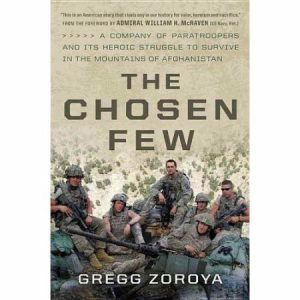 The Chosen Few is the saga of a single company of U.S. paratroopers who were deployed to Afghanistan in 2007, hoping to win the hearts and minds of remote mountain people who know very little of the world outside and nothing of the geopolitical forces that brought this carnage upon them or the strange looking Americans who have appeared in their midst. All they know is the violence, destruction and death that have come to their remote land, and the challenge of surviving amid the carnage.They are forced to choose between the violent Taliban and the unfamiliar faces from faraway. Their own survive and that of their families depend on which choice they make. Not surprisingly, many if not most of them try to hedge their bets waiting to see which side prevails. irrelevant. They are locked in mortal combat with a determined foe in a harsh and forbidding landscape as strange to them as the moon was to astronauts. Their loyalty is not todistant politicians but to their buddies fighting beside them. Their 15-month fight culminated in the bloody 2008 battle of Wanot, one of the war’s deadliest encounters. Those who survived were honored on their return and celebrated for their display of courage and determination against insuperable odds. This book is swift-paced and captures the sweat and fear of combat, bringing it home to those of us who care about our valiant troops and grieve for their sacrifices. It is comparable to Sebastian Junger’s War published in 2011. Junger, author of The Perfect Storm, is also a journalist and like Zoroya lived among the warriors and brought a journalist’s discerning eye to the pain and violence around him. Zoroya’s book belongs alongside Junger’s and among the best of the war chronicles of Iraq and Afghanistan. It underscores the critical debt all Americans owe to the heroes who defend our values against the relentless forces of darkness and repression.